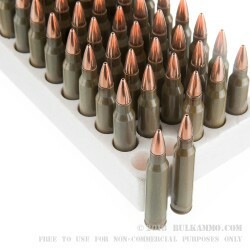 As the needs of NRA and competitive three gun shooters continue to evolve, so to has the need for a reliable, economically priced ammunition for high volume shooters across the county. 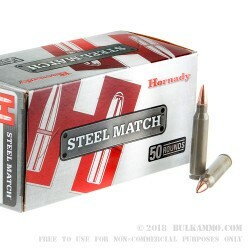 The Hornady 55 grain .223 Hollow Point Steel Cased Match is Hornady’s solution to this growing demand, and has taken the competitive shooting world by storm ever since. Steel cased cartridges make for a more cost effective solution over their brass counterparts, and provide identical chamber pressures and performance at nearly half the cost. 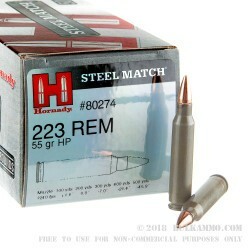 Loaded with Hornady’s signature match grade bullets, the Hornady 55gr .223 Hollow Point Steel Cased Match has near identical performance to Honrady’s high performance lines, at a cost that you do not have to be afraid to shoot. Powder loads are carefully measured for consistent and reliable point of aim, point of impact regardless of lot or date of manufacture, and non-corrosive berdan style primers ensure hot ignition regardless of the climate. 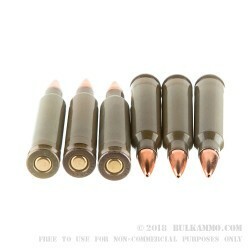 High volume shooters in need fo an economical solution that will not leave the falling behind the rest of the pack will rejoice with the Hornady 55gr .223 Hollow Point Steel Cased Match.